Saoirse Ronan is a young immigrant in “Brooklyn,” a film named for her destination when she leaves Ireland in this John Crowley film based on the Colm Toibin novel by the same name. “Brooklyn,” a lovely film based on the even lovelier novel by Colm Toibin, feels like an answer to that question. 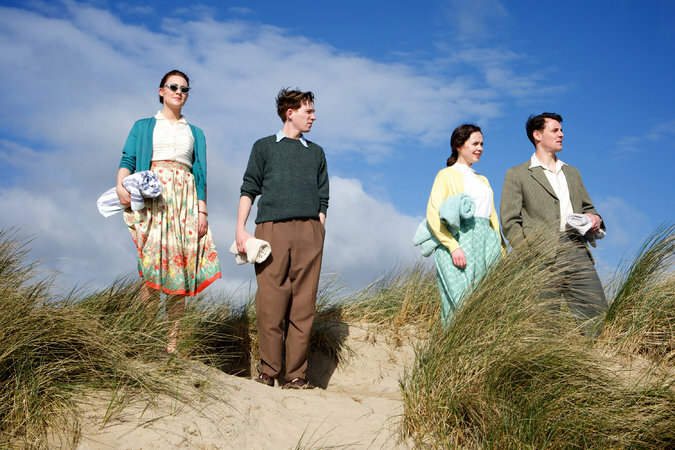 Set in its titular borough and in a small Irish town in the early 1950s, it is both sharply observed and gently nostalgic. “Brooklyn” is an old photograph without a frame, an implied flashback. Nothing in the film takes place in the present, but everything in it is carried on an invisible current of imaginative retrospection. Like its literary source, the movie, directed by John Crowley (“Boy A”) and written by Nick Hornby, feels like the result of a child or grandchild’s inquiry into the lives of a previous generation. How did Mom and Dad meet? What were they like? Why did they get married? Where did we come from? It’s quite a tale, and also a perfectly ordinary series of events, strung together by chance, choice and perhaps a touch of grace. At one point, Eilis Lacey (Saoirse Ronan) — the Irish lass whose coming-of-age is the film’s principal interest and reason for being — takes an excursion with Tony Fiorello (Emory Cohen), her Brooklyn beau. Standing on a windswept patch of grass out on Long Island, Tony spins a vision of a nice house and a thriving family plumbing business: a quiet, prosperous life beyond the cramped confines of the city. Sitting in the theater, the 21st-century viewer can fill in the blanks, conjuring a time-lapse picture of the growth of the suburbs and the unfolding of a long marriage. Tony and Eilis grow old before our eyes, and the world changes around them. The Dodgers go to Los Angeles. The kids go to college. Some of them eventually move back to Brooklyn. But it isn’t that simple, really. And it’s also much simpler. “Brooklyn” endows its characters with desires and aspirations, but not with foresight, and it examines the past with open-minded curiosity rather than with sentimentality or easy judgment. Its New York and Irish landscapes are both romantic and constricting. There are streetcars, rooming houses and department stores on one side of the ocean, tidy shops and dark-paneled pubs on the other. There are also a lot of rules and expectations for young people, women in particular. Eilis does not experience these norms as unduly oppressive. They are what she’s used to and also, as such, the condition ofShe leaves home not to flee political violence or desperate poverty — as millions of earlier immigrants from Ireland and other parts of Europe did — but to escape the narrowness and limited opportunities of her hometown. She leaves behind a mother (Jane Brennan) and an older sister (Fiona Glascott), and endures seasickness on the boat to New York and homesickness once she arrives. The streets of Brooklyn are not paved with gold, but there is a room in a brownstone and a position as a sales clerk waiting for Eilis when she arrives. She is counseled by a benevolent priest (Jim Broadbent), looked after by a sharp-tongued landlady (Julie Walters) and instructed in the ways of American femininity by her supervisor at work (Jessica Paré) and by the other residents of the boardinghouse. After a while, Eilis’s loneliness starts to abate. She takes night classes in accounting and does very well. She meets Tony and his Italian-American family, who are about one meatball away from being complete ethnic stereotypes but hard to resist for just that reason. When a family emergency summons Eilis back to Ireland, “Brooklyn” discovers its plot and reveals the stakes of its heroine’s story. And heroic she is, even though her drama is firmly anchored in the mundane. At home, she finds familiar comforts and also a new suitor, a local boy grown into handsome Domhnall Gleeson. Eilis’s romantic predicament is agonizing, for her and also for the viewer. I can’t remember the last time I cared so much about the marital prospects of a fictional character, and I don’t think that’s just because it’s in my nature to root for a guy named Tony against a skinny redhead. The real reason is Ms. Ronan, who has grown from an uncannily intelligent child actor into a screen performer of remarkable force and sensitivity. On the page, Eilis comes alive through the fineness of Mr. Toibin’s prose. A devotee of Henry James, he registers the fluctuations of the character’s inner weather with meteorological precision. Inwardness is a great challenge for filmmakers. The human face is a wall as well as a window. Words lose their power. Everything depends on the ability of actors to communicate nuances of feeling and fluctuations of consciousness. And Ms. Ronan uses everything — her posture, her eyebrows, her breath, her teeth, her pores — to convey a process of change that is both seismic and subtle. Eilis is in transit, and to some degree in limbo, caught between two stages of life and two very different conceptions of home. By the end of “Brooklyn” she is no longer who she was, even as she seems like someone we have always known. “Brooklyn” is rated PG-13 (Parents strongly cautioned). Some mild swearing and discreet but intense sexuality. Running time: 1 hour 51 minutes.